Floriculture publishing is all we do. We eat, sleep and breathe the art and science of communicating with greenhouses and garden centers. I’m a 30-year veteran of the industry, 20 years of that in communications. Ellen Wells, editor-at-large of Green Profit, has a masters in horticulture from Cornell. Publisher, Paul Black has spent 20 years honing the craft of helping his clients reach their customers. You’ll see that focus in every issue of GrowerTalks, Green Profit and our e-newsletters, Acres Online and Buzz! 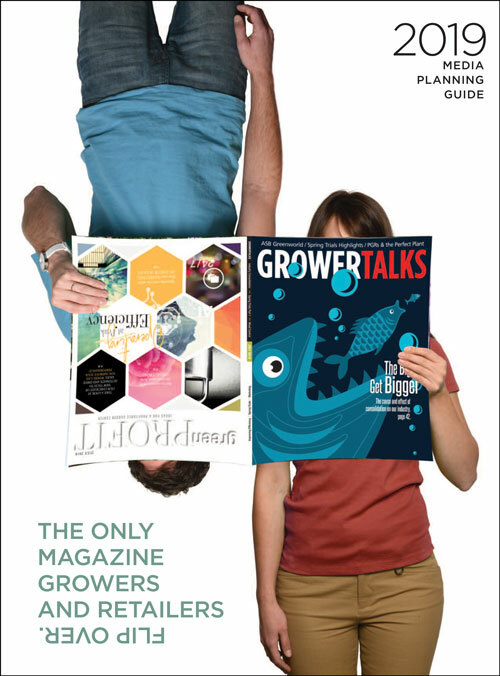 GrowerTalks gives readers almost 470 editorial pages per year. The competition averages just 241. Green Profit averages 360 pages of editorial per year. The retail competition averages just 157—that’s less than half the content. While other publishers are cutting back and downsizing, we’re continually investing in our product to make it the biggest and the best— higher-quality paper stock, professional photography and a unique “flip” format that stands out from the competition. We’re different, we’re better, and readers appreciate that! With two magazines in one convenient package, your message reaches more new customers than ever before possible. There’s no better way to stretch your advertising dollar. And if you combine your print ads with our revolutionary e-newsletters, you get an advertising reach that just can’t be beat. But don’t just take my word for it. Put us side by side with the competition and judge for yourself. And ask the real experts, your grower and retail customers. They know which magazine helps them grow their businesses in these challenging times. Then give us a call—we’ll help you grow your business, too.